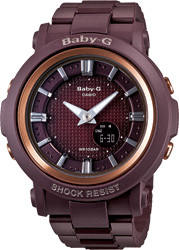 Introducing the latest additions to the Baby-G lineup of Neon Illuminator watches. Black light reflective paint is used on the hands and face, so they change color to red or blue when exposed to black light. Hour markers have a metallic finish that adds a sharp accent to the face design. 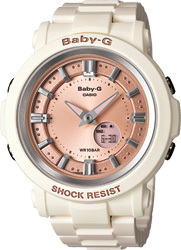 All of this plus a 3-level face creates an overall look that is Baby-G cute. 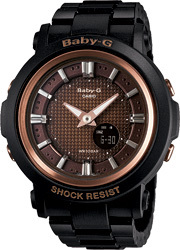 The bands of these watches are made of highly wear, cut, and fade-resistant Fine Resin. Since resin is lightweight, the overall weight is kept low even though the watch as a large case. The band center element is done to a hairline mirror finish that makes these watches as fashionable as they are practical. Fine Resin is a type of polyamide resin that is strong and highly resistant to chemicals as well as discoloration caused by UV light. It has been approved as Class VI product by the U.S. Pharmacopeial Convention (USP). These properties combined with the face that it is lightweight, make Fine Resin perfect for the kind of watches women like to wear.